Regular visitors to DN will already be familiar with the names of Daniel Chester (The Moth Collective & Mad Dogs and Englishmen) and Beakus Animation production studio and the impressive work they both produce. 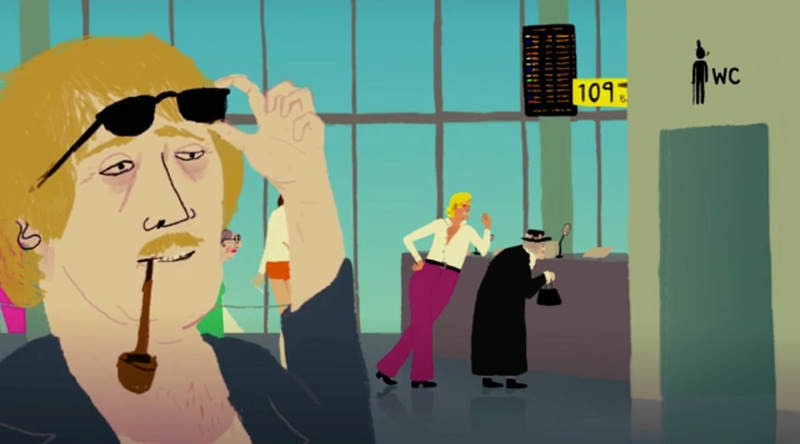 2012 saw the two animation powerhouses combine to produce a surreal and hilarious section for the stereoscopic animated feature film A Liar’s Autobiography, the untrue story of Monty Python’s Graham Chapman. We asked Daniel to clue us into how he became involved with the project and what it was like working in stereoscopic 3D. It was definitely the Monty Python connection that got me interested, Steve Smith from Beakus studios asked if I would like to pitch, and as a massive MP fan I just had to try real hard to contain my excitement. Who doesn’t love Monty Python? The other thing that attracted me was the creative freedom, mainly because this section had absolutely no bearing on the main storyline whatsoever, so I could do whatever I wanted and totally get away with it. The stereoscopic thing was a real issue as all my work up to that point was heavily based on line work and sparse colour. I didn’t see that translating very well to 3D, so just tried to develop the style into something that would be more suitable and look ‘fuller’ on a big screen. It was also a lot more software focused, so I had to do some pretty major youtube tutorials. None of us had really worked with stereoscopy before, so it was a pretty daunting task when we started. I take my hat off to the animation producer Justin Weyers who was managing to organise and liaise with about 20 different directors to get this film done.